PORTLAND -- A plan to protect threatened and endangered fish while operating Northwest hydroelectric dams has been ruled unlawful by a federal judge. However, the judge will allow the plan to remain in place while federal agencies devise an alternative strategy, effectively preserving the status quo until the end of 2013. The judge also ordered the federal government to consider the possibility of dam removal and other modifications to the region's hydropower system -- steps supported by environmental groups. U.S. District Judge James Redden ruled that federal agencies violated the Endangered Species Act in approving the plan because it relies too heavily on vague future actions past 2013. Many mitigation projects aimed at ensuring the survival of salmon species have already been canceled or delayed, Redden said. "In other words, federal defendants do not know what exactly will be needed to avoid jeopardy beyond 2013, or whether those unknown actions are feasible and effective, but they promise to identify and implement something," he said. "This is neither a reasonable, nor a prudent, course of action." 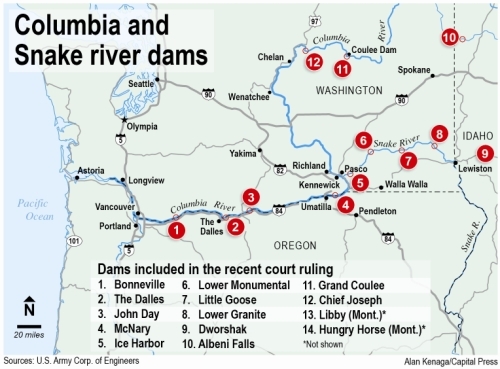 Irrigation and electricity groups involved in the decade-long case are frustrated because the ruling doesn't resolve questions about the future of 14 hydroelectric dams included in the plan along the Columbia River and its tributaries. "It would help to have more certainty and clarity over the direction," said Scott Corwin, executive director of the Public Power Council, which represents consumer-owned electric utilities. The opinion's immediate impacts are still difficult to decipher, as it will depend on the federal government's implementation of the ruling, Corwin said. The decision fails to establish how federal agencies should determine jeopardy to fish, but nonetheless encourages them to implement further costly measures, said James Buchal, an attorney representing several irrigation groups. "We don't know if the stuff works at all, but by God, we need more of it," Buchal said, summarizing the ruling. Rather than bringing a conclusive resolution, the ruling simply allows the litigation to continue, he said. "It's a case study in the devolution of law," Buchal said. "If law itself is gone and becomes a forum for what people want, and they always want more, this is what you get." That characterization is disputed by environmental groups involved in the case. The judge has now reversed the federal government's plan for the third time because agencies have continually failed to follow the correct path, said Todd True, an attorney for Earthjustice. "The court has said, 'Get it right,'" he said. Environmental groups don't call for the complete dismantling of the hydroelectric system, but instead want four dams along the Snake River to be removed, True said. Those dams provide a small amount of electricity -- primarily during high spring water flows when energy demand from heaters and air conditioners is low -- while posing a serious hazard to salmon, he said. "Removal of these four dams has the most bang for the buck at the least cost for the region," True said. Those dams generate about 1,000 megawatts of electricity, enough power for 730,000 homes in the Northwest, according to the Bonneville Power Administration. Their total capacity is more than 3,000 megawatts, or roughly 5 percent of the total federal hydroelectric system's capacity, according to BPA. Other measures, such as spilling more water from dams and drawing down reservoirs to reduce disease and predation of juvenile fish, may also be effective, said Dan Rohlf, another attorney for environmental groups. Federal agencies should look further to changing operations rather than trying to preserve the status quo, he said. "The judge emphasized we need to look holistically at this system." Glen Spain, regional director for the Pacific Coast Federation of Fishermen's Associations, said he expects the ruling will prompt the federal government to work out a plan with plaintiffs in the lawsuit. "We're calling for a table to negotiate a regional solution. It's more than past time," he said.